Bringing up Muffin: Thanks everyone! 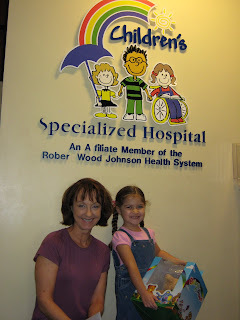 Thanks to everyone that donated to the Children's Specialized Hospital for Muffin's birthday party! We took the checks over and they thanked her by giving her a sparkly new teddy bear. We collected a total of $330 in donations !! 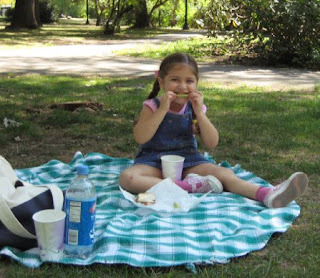 It was such a gorgeous summer day, that we decided to follow up our good deed by having a nice little picnic lunch. Yum! As you can see she was hamming it up to the camera. She is getting soooo Big!! pretty soon she will be in school! !